Friday night’s Prasopita (prah-SO-pee-tah, Greek leek pie) tasted great, but producing it was not pretty. I learned, yet again, to embrace kitchen disasters for their educational benefits. It was one of those evenings where everything went wrong. From dodging falling knives to cleaning up egg-splattered floorboards, the frustrations accumulated. It was typical that I opened the filo and found the sheets of pastry inseparably stuck together. All but six were unusable and went straight into the garbage. I quickly mixed up dough for an olive oil crust, and switched to making tri-cornered hand pies. Unfortunately, I didn’t make nearly enough pastry dough. It started running out while I still had a bowlful of filling. Too impatient to make more pastry, I rolled up the remaining dough and made an open-face, free-form tart. When I was done, I had three filo-wrapped traditional Prasopites, six tri-cornered leek hand pies, and one free-form leek tart. Although I hadn’t planned it, this gave us the opportunity to directly compare filo-wrapped pies with those having a simple olive oil crust. The comparison was enlightening. As between the filo and hand pies, it wasn’t a close call; the filo pies were far superior. Crisp filo pastry was the perfect counterpoint to the savory leek filling. Although the hand pie crust was flaky, the filling to crust ratio was too low and the crust’s flavor too dominant. The open-face tart was another story. 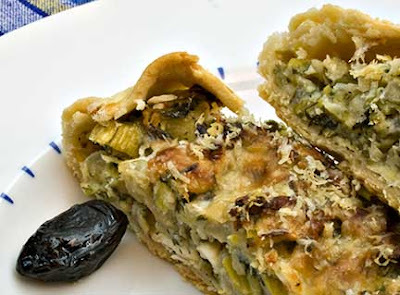 In this version, the single layer of olive oil crust nicely balanced the flavorful leek filling. Even better, the crust held its integrity and remained crispy even after it had been in the refrigerator for two days. This is not true of filo-wrapped pies; they rapidly lose their crispness after even a short time in the refrigerator. So what will I do in the future? For a party, or any situation where pites are likely to be eaten quickly, I’ll stick with traditional filo. Nothing beats buttery-rich filo wrapped around leek and herb filling. I’ll also use filo when I’m not planning to bake all the pies at one time – unbaked filo-wrapped pies freeze well and can be popped in the oven direct from the freezer. 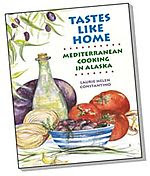 On days when I want Greek pie, but am in a hurry and don’t want to mess with filo, or when I want to limit the amount of fat I ingest, I’ll make an open-face tart. It’s an easy, extremely flavorful, savory treat. I’d happily serve it for any occasion, special or not. First, pronunciation; in English, there are multiple ways to spell filo (fillo, fyllo, phyllo) because Greek to English isn’t transliterated consistently. But no matter the spelling, the pastry is pronounced FEE-low. As with the ruined mess I faced on Friday, stuck together filo sheets are the bane of a cook’s existence. It is generally caused by improperly storing filo, by thawing and refreezing filo, or by leaving filo for too long at room temperature. To avoid this problem, buy from stores that sell a lot of filo. When you are ready to use it, thaw filo overnight in the refrigerator, bring it to room temperature before you start to work with it, and use the thawed filo within a week. Finish making the filling, including cooling it, before you open the package of filo. Filo is a lot more forgiving than it might seem. A few rips and tears don’t make any difference at all, and usually disappear in the many layers of filo or when a pie is shaped or rolled. Dried out filo breaks apart and makes working with it difficult to impossible. Once filo is removed from the package, you either must work very quickly or must cover the filo sheets with a slightly damp cloth. The first few times you work with filo, the damp cloth is a must. As you gain confidence, you’ll be able to work quickly enough that the damp cloth is unnecessary. If you want to make your own filo, Peter Minakis explains how here. If you want to see how filo is traditionally made in Greece, Maria Verivaki has a video and explanation here. 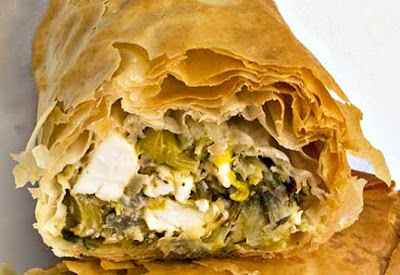 For vegans or those who are fasting, leave out the feta and eggs, and brush the filo sheets only with olive oil. Freeze extra Prasopites and bake frozen, adding 5 – 10 minutes to the baking time. Make the Filling: Sauté the leeks and onions, lightly seasoned with salt and freshly ground black pepper, in olive oil until the onions soften and start to turn golden. Put in a bowl and mix with all the remaining filling ingredients, except the eggs. Taste and add salt or freshly ground black pepper, as needed. Stir in the eggs. Clarify the butter (see NOTE below for why and how to clarify butter). Mix the clarified butter and olive oil, and brush a rimmed baking sheet with the mixture. Alternative 1 - Shaping Large Prasopita: Remove the filo from the box, unroll it, and cover any you are not actively using with plastic wrap or a slightly damp cloth. Lay one 18” x 14” sheet of filo out on the counter and brush it lightly with butter-oil. Cover with another sheet of filo and brush it lightly with butter-oil. Spread 1/2 cup of filling along one of filo’s short edges. Fold in the sides and roll up the filo. Place roll on the prepared baking sheet seam side down and brush lightly with butter-oil. Repeat until all the pastries are rolled. Alternative 2 – Shaping Small Prasopita: Follow the directions for shaping large Prasopita, but use 9” x 14” filo sheets or cut 18” x 14” filo sheets in half and use 1/4 cup filling. Alternative 3 – Make Open-Face, Free-Form Tart: In a food processor mix 2 cups flour, 6 Tbsp. olive oil, and 1/2 tsp. salt. Mix in as much water as necessary (4 – 6 Tbsp.) to make dough that sticks together. Form into a ball and let rest at room temperature for 30 minutes. Roll out the dough into a 12” circle, place on a baking sheet, and spread the filling out on the dough, leaving a border of 1 1/2”. Sprinkle a little freshly grated parmesan cheese over the filling. Fold up the edges, sealing with water as necessary for folds in the dough to stick together. Place the Prasopites (or tart) in the oven and bake for 30 – 40 minutes, or until the filo is brown and crispy (or the tart pastry is set and lightly browned). NOTE: Clarified butter is butter with the milk solids removed. To clarify butter, melt it in a saucepan or microwave and skim off and discard the white foam that rises to the top. Pour the clear yellow butter into a bowl, being careful to keep the milky liquid that sinks to the bottom of the pan out of the clarified butter. Discard the milky liquid. If you don’t clarify butter used for separating layers of filo, the pastry won’t cook correctly, and will be soggy rather than crisp. UPDATE: Maria Verivaki recently made this Prasopita, and shaped it into one large sprial pie (called Strifti - Στριφτή - in Greek). Here's Maria's post about Prasopita Strifti. This is my entry for Weekend Herb Blogging, hosted this week by its creator Kalyn of Kalyn’s Kitchen. I love all the variation here Laurie! I find filo a pain to wrk with personally but I like the advice you've given about using it. leeks are delicious and I've eaten prasopita a few times before. Your recipes are always inspiring! I don't think I'll make the phyllo myself but thanks so much for sharing and for the tips. Also the filling sounds fantastic to me, Laurie! Laurie, despite your bad luck, all the creations look just fine. As for the phyllo, don't be so hard on yourself. Half the time the phyllo you bought is to blame...damaged, freezer-burned, thawed & frozen at the grocer, etc. It's best to buy the phyllo from a store with a high turnover (I know, you're in Alaska). excellent advice Laurie; even though you live in Alaska, feel for us here in Greece with frequent power cuts and suspect storage... That's why I gave up buying filo and now buy the fresh stuff only when I need it. and i forgot to say - another great pie for me to try! Wow, what a great post about fillo. I only have tried filo a couple of times (complete failures), but maybe... I will have to bookmark this page and try phyllo on another day. you're making me hungry. Thanks for such an informative and useful post. Thanks for the filo tips Laurie. I've not had great success with it in the past, but soon I am going to buy some because there are so many fantastic recipes out there calling for filo. Thanks for the filo primer, I have not heard that clarified butter was essential before. Maybe that's why I haven't had great luck w/filo. I've been thinking of oniony pies, too, since Ewa sweet onions just came into season. Love your quadruple-allia version! I love the filling - anything with leeks and herbs! I would never attempt to make filo, but I can get good filo at our local supermarket, fresh - Which means I can buy it, use what I need and freeze the rest...only freezing it once! I may have to try that olive oil crust tho...if I'm very brave! Been lurking on your site a bit and this has compelled me to comment. Thank you immensely for the filo dough tips. I may feel ever so slightly more likely to try this recipe now. I love filo dough so much but it intimidates me. This looks fabulous and I might just have to overcome my fears! What a great post. I've only used filo once, making baklava with someone else giving me instructions and me just attempting to do what she told me to do. It was challenging, although our baklava was a big hit. The pies all look great to me; I've have a hard time deciding which was best. 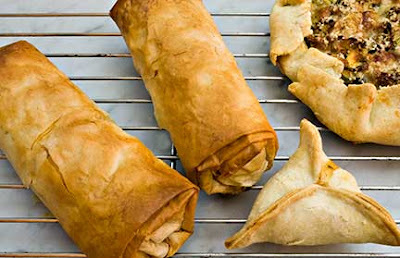 Those phyllo pies look really good and the leek, dill and feta filling sounds really tasty! I just used phyllo for the first time the other week to make baklava. I am eager to work with it again and a savoury dish sounds perfect. Thanks Peter G! The variations turned out to be fun, even though they were inspired by necessity. I always think filo seems harder to think about than to do. Except for when it's impossible, of course! Nuria, the filling in a tart crust is so good. Peter M, yes I agree completely. Healthy turnover is very important. Maria, oh how I wish I could find the fresh stuff. I also really miss the thicker filo you can buy in Greece - here, they only sell the lightweight kind like for baklava. You should definitely try this pie! Lannae, too bad about your filo problems! It really is pretty easy once you get the hang of it and realize that it is more forgiving than it might seem. Rips and tears don't matter at all. Amiable Sam, I'm so glad you liked it. Prasopita is really one of my favorites. Judy, inspiring hunger is what I'm aiming for! Thanks for visiting. Lisa, I've read your blog enough to know that working with filo should be a snap for you. I wonder what kind of problems you've had with filo? Manju, you definitely have to clarify the butter - it needs to be pure fat without the moisture that butter holds. You just reminded me I meant to write about the four different alliums! Katiez, anyone who can buy fresh filo is completely lucky in my book. Bravery is not required - the olive oil crust is so easy. Cookinpanda, thanks for delurking! Don't be intimidated, really, it isn't that hard. Kevin, congratulations on your maiden filo voyage! I admit to liking savory filo pastries better than sweet ones. If you like leeks, this is good one for you. I loved this post. I've been there before-the phyllo frustration. Usually, it happened before a party and everyone was dying for my spanikopita! Somehow it did always work out. Funny, I haven't made anything with phyllo since I've been here! It occurred to me as I read this post. MIL is doing a great job making her pitas for us. The open faced free form tart looks incredible! And boy, do I enjoy leeks - especially when they are carmelized and thrown into an omelette with some smoked cheese! Thanks, Cheryl, I'm glad I'm not the only frustated person. MMMmmm, I bet your MIL makes wonderful pita. Lucky you. Bijoux, now that sounds really tasty. I haven't had smoked cheese in years - now that I've been reminded, I'll have to go buy some. The filling sounds delicious. I love leeks. But I am still scared by filo: I can see myself getting into a lot of trouble with it. The tri-cornered hand pies look cute. Oh wow, prasopita!! I love love love it (and I miss it: you've made me homesick). I am more used to making spanakopita at home, but I'll make this too for sure very soon. Thanks! Simona, you shouldn't be afraid of filo - you won't get into trouble. Filo is very forgiving of mistakes, rips, tears, whatever. Plus, it tastes so good! Maninas - glad you liked it! Cassandra - I'm with you on prasopita - it is one of my favorites. Thanks for stopping by my blog!